The Cemetery is open to the public throughout the year but the Council reserves the right to exclude the public if it should be necessary at any time. 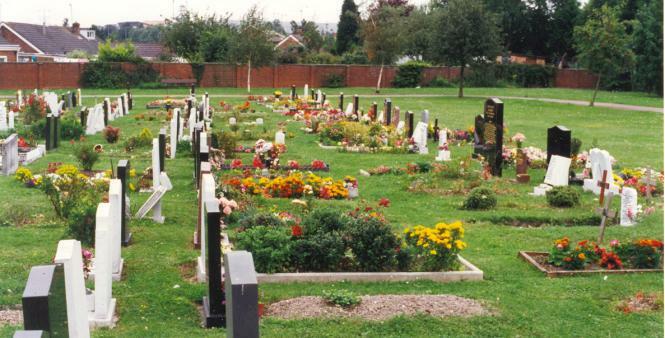 Houghton Regis Town Council manages the Houghton Regis Cemetery and takes pride in maintaining it to a high standard and creating an atmosphere of peace and calm. The cemetery is managed in accordance with approved Cemetery Regulations. Visitors to the Cemetery are asked to observe the regulations governing the Cemetery. The Registers and records relating to the Cemetery are available, by appointment, for inspection at the Council Offices. As the current space within the existing cemetery off Cemetery Road continues to reduce the council have been working hard to make additional provision. This work has been following 2 strands. The first being the design and development of the remaining space within the current cemetery. It is intended to create a truly beautiful and peaceful area whilst providing residents with a variety of options for ashes entombment. The design work is nearing completion and hopefully we will be able to share a design shortly. We would welcome your comments on this. The second strand relates to the ongoing search for new cemetery land. As you would expect with all the development taking place around the town, this is not proving easy. The Sub Committee have been considering a variety of sites but for various reasons space within the existing town is unsuitable. The search has however extended into the areas around the town and we are working with a cemetery consultant to assess areas and provide preliminary advice and with Central Bedfordshire Council to help us with land purchase options. The council really do appreciate the local demand from residents for burial and interment options to be provided in the longer term within the town. We are working hard to ensure that this continues to be provided. However many hurdles are being experienced but please be assured we are continuing our work to provide residents with this invaluable facility. The town council are keen to hear your views on the design of the new area within the Houghton Regis Cemetery. The consultation runs from 14th to 31st January 2019 Consultation responses will be considered by the Environment & Leisure Committee on 25th February 2019(7.30pm, Council Offices). As the space within the existing cemetery, off cemetery road, continues to reduce, the council have been working hard to make additional provision. It is intended to create an attractive and peaceful area whilst providing residents with a variety of options for ashes memorialisation. With this design the council will only be offering above ground options for ashes. This is to take full advantage of the space available to ensure that families and friends have memorialisation opportunities in the future in Houghton Regis. The council really do appreciate the demand from residents for burial and interment options (below ground) to be provided in the longer term within the town. Whilst there are many hurdles, please be assured that we are working to provide residents with this facility and we hope to consult with you shortly on this.